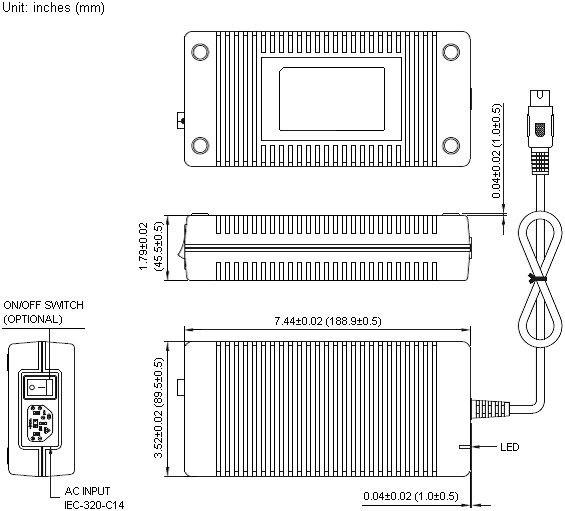 The DTMPU130 Series of AC/DC medical approved power supplies provide 130 Watts of continuous output power. All supplies are Energy Star 2.0 Level V and UL94V-1 min compliant. This series has single output models with an input voltage range of 90~260VAC. These supplies also have an IEC-320-C14 AC input for worldwide applications. This series is best suited for use in hospital instrumentation and many other applications. All models meet FCC Part-18 class B, CISPR-11 EN55011 class B emission limits and are designed to comply with UL/c-UL (UL 60601-1), TUV/T-mark (EN 60601-1) and new CE requirements. All models are 100% burn-in tested. Notes: 1. Model DTMPU130-105 needs to use AWG#16*5C/4FT output cable and model DTMPU130-24 needs to use AWG#16*2C/4FT output cable in order to meet the specified regulation and efficiency. The regulation and efficiency will change if a different output cable is used. 2. Optional output connectors available. Please call factory for more details. 3. ON/OFF switch is optional.